I don’t get Belgians. The country is locked between the beer wasteland of France, the beer wasteland of Switzerland and Heineken-occupied Netherlands. (OK, you’ll say it also borders Germany. What are you, a park ranger now?) Yet for centuries it has produced the most complex and unique beers on Earth, and has done more to influence brewing around the world than probably any other country. I’ll be honest. I find Belgian beers pretty inaccessible. While Brother Barley will wax poetic* about all things Belgian (beer, waffles and female tennis players… is there anything else? ), I didn’t spend a month sowing my wild hops around the Belgian countryside. Again… I don’t get Belgians. * In fact, Brother Barley previously reviewed the Reverend in one of his patented “six beers in one post” columns. Despite his infinitely greater knowledge of Belgian ales, since he didn’t have the courtesy to notify me that he had already posted a tasting note about the Reverend, I hereby demand that the link on our tasting notes table of contents be redirected here. Failing that, I reserve all rights to react accordingly. Which can go badly. Americans are great at taking challenging foreign tastes and bastardizing them for consumption by the unwashed masses. Often this just involves adding salt, sugar and/or cream. 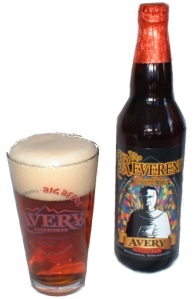 In the case of Avery Brewing Co.‘s The Reverend Belgian Quadrupel Ale, however, an American brewery made an authentically Belgian beer that red meat eaters can appreciate. STYLE: Belgian Quadrupel Ale. As has been recited in these pages before, I am uncultured. I had no idea what a Belgian quad was until after I finished the Reverend. As it turns out, our own Brother Barley offered an informative, if ludicrous, primer. So I can’t tell you if the Reverend is true to the style. All I can tell you is it is damn good. APPEARANCE: Amber, cloudy. Not as dark as many Belgian quads–looks more like an IPA. NOSE: Sweet, floral, somewhat yeasty. Belgian but with a floral twist. TASTE: Sweet and spicy with hints of nutmeg. Incredibly malty but very well balanced. MOUTHFEEL: Extraordinarily thick and viscous for a reddish beer. Little carbonation. DRINKABILITY: Avery gets an A+ for making a 10% ABV Belgian-style ale that’s drinkable. It’s pretty well balanced without the aftertaste that a lot of Belgian ales have. And it does not have a hint of booziness to it. I find high-gravity Belgian-style ales to be pretty inaccessible, so the accomplishment of making the Reverend tasty to an American palette should not be understated. Posted in Tasting Notes.Tagged 3.5 Hops, Avery Brewing, Belgian Quad, Belgian Style, Colorado, high gravity, Tasting. Uh…Belgium does NOT border on “the beer wasteland of Switzerland”. Geography FAIL. Well, you’re right — I was thinking of Luxembourg — but from now on, on Aleheads, Belgium borders Switzerland. It has to do with the infallibility doctrine. Please update your maps accordingly.